All channels of the Dynatron 25 Series D625B 5 Channel Muscle Stim allow fully-independent treatment for Interferential, Premodulated, Biphasic, High Voltage pulsed stimulation, and Russian muscle stimulation. Prescription required. 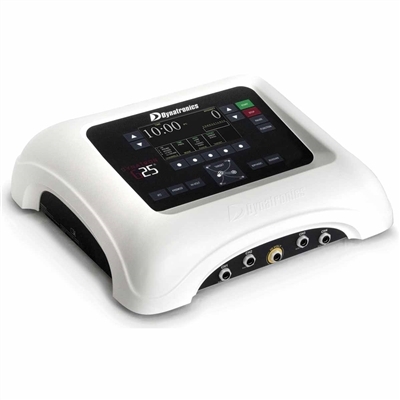 5 Channels: All channels allow fully-independent treatment setups for Interferential, Premodulated, Biphasic, High Voltage pulsed stimulation, and Russian stimulation using any available electrotherapy channel. Target & Target Sweep for Interferential Treatments: Simply glide your finger across the TARGET touch-pad to move the center of interference to the site of your patient ins pain. Available on all 25 Series electrotherapy devices.